With gardens "à la française" with the topics "Gold and Alchemy", the residence of the Marquis de Jumilhac (1655), fortress of the 13th century altered with the Renaissance and the 17th century, is unique in France by the diversity of its roofs decorated with allegorical ridge tiles. Room of the Ropemaking machine (frescos and legends), staircases means-ageux or of pageantry, large-living room parqueted "à la Versailles", chimney out of wooden carved Louis XIII, kitchen and its coppers, dining room voutée, Richelieu show, rosery and labyrinth... confer on this jewel : splendour, charms and mystery. 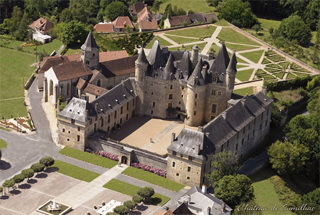 Classified Historic building, this major site of the Natural reserve Périgord - Limousin accomodates all the year : visits, shoots, receptions, shows, theaters, concerts, exposures, etc.